How to Measure Ozone Concentration? 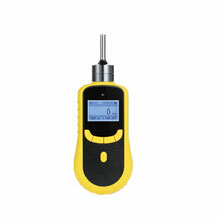 Home » Solutions » How to Measure Ozone Concentration? Start the central air-conditioner. Confirm that there is air blown into the clean space for the wind to blow in. Inject cooling water into the ozone generator. Confirm that the ozone outlet has used pipeline to get connected with the central air-conditioner's air sending or air return pipeline. After that, start the oxygen generator for one hour. Method to get the oxygen concentration detector started: Press on ⊙ (on/off key) for five seconds. After there is display on the gas detector, release the button. The machine heating lasts for 120 seconds. After that, the ozone concentration in the air can be detected. The oxygen concentration is displayed on the display panel of the detector in the digital form. When the oxygen concentration exceeds 20ppm, the ozone detector will raise an alarm and flash, and the maximum range is 100ppm. Generally, it is suggested entering the clean area at different periods of time to detect the ozone concentration. Later, the ozone generator is detected once after 30min and 60min, respectively. If necessary, the ozone generator will be tested by every 90min and 120min, respectively. After the oxygen generator works for 30min, the ozone concentration can be detected right now. The ordinary working hour is one hour. If the ozone concentration cannot be detected or the ozone concentration is lower, it should be detected whether the ozone is injected into the pipeline or whether the ozone leaks out. If there is any leakage, the ozone concentration will be lower. If the ozone concentration is too high, the sterilization time can be controlled. Soak the ozone oxidization color-variable reagent in the carrier as the reactant. Seal it in the glass tube as the detector tube. In the use process, cut the two ends of the detector tube apart. Connect the aspirator to the outlet of the detector tube to take in a fixed quantity of ozone. The ozone concentration and the color-changing length of the reactant within the detector tube are in direct proportion to each other. The concentration value is read by the scale interval.